DPS and DCTA reached an agreement to end the strike early Thursday morning. The full union must ratify the deal. The union and district signed off on a tentative agreement and teachers are free to return to the classroom Thursday if they choose. The agreement must still be ratified by the full union. 5:45 a.m. Feb 14. - The union finished presenting its counteroffer to the district. It appeared that both sides were in agreement. "There's been a lot of compromise on both of our parts to get us to where we are this close to being able to sign on the dotted line," said Denver Public School District Superintendent Susana Cordova. District officials left the room to look over the deal one more time. Union members stayed there waiting for the district to return. District officials and union members just returned from caucus. Both sides are back in the room where the union is going over its counteroffer with the district. The union says it wants to continue to talk about issues regarding SSPs. (specialized service providers) They'd also like the deal to go through 2022. The lead union negotiator says they're in agreement on distinguished schools. Rob Gould said they have a salary schedule, if you accept it, "please accept it". The comment was meant with laughter from those in the room. The Denver teachers union and school district officials are still at the Denver Public Central Library where they continue to negotiate. They have been at the library since 10 a.m. Wednesday morning when a second day of negotiations began. It is unclear at this time what this means for schools later this morning or whether teachers will be back out on picket lines. 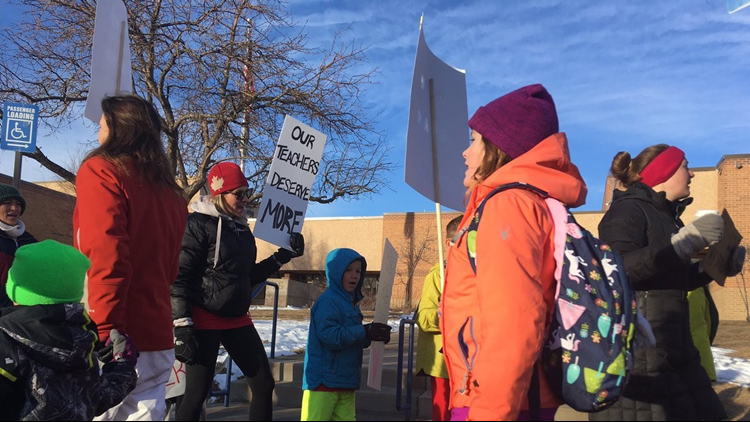 Discussions to end Denver’s first teacher strike in 25 years will continue into Thursday after the Denver Classroom Teachers Association and Denver Public Schools were again unable to strike a deal. For the second night in a row, both sides negotiated late into the night in the basement of Denver Central Library. The tone of Wednesday’s discussion, however, was lighter than it had been, with occasional jokes and both sides each other each time a new proposal was introduced. Both DCTA and DPS also agreed that significant progress was made during Wednesdays’ negotiations. The district made an offer for more money in base pay, along with fewer credits for teachers to get to the next salary level, and more predictability overall when it comes salaries.